The 2014 West African Ebola Outbreak is now the largest and deadliest in history. But how far will it spread? Using the most recent data, a research team has created a computer simulation of its potential to reach around the globe, illustrating the urgency for containment. 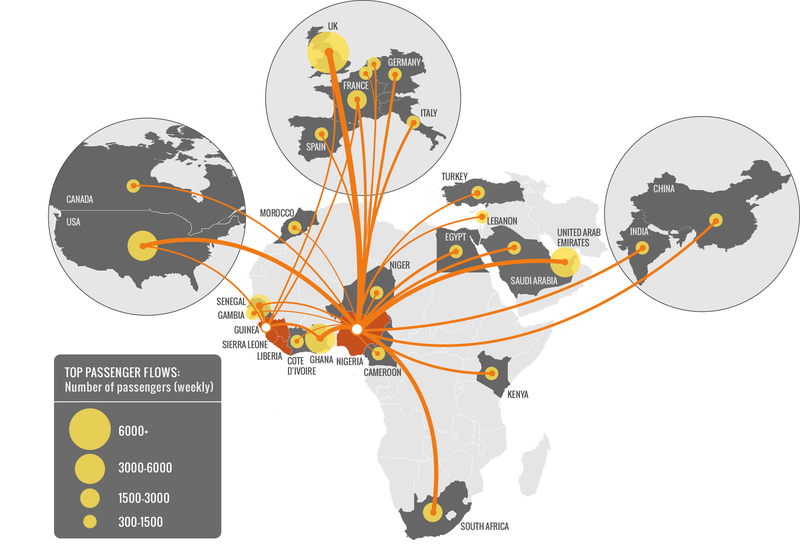 Top image: Air traffic connections from West African countries to the rest of the world: "Guinea, Liberia, and Sierra Leone are not well connected outside the region. Nigeria, in contrast, being the most populous country in West Africa with more than 166 million people, is well connected to the rest of world. For historical reasons, all these countries have the strongest ties with European countries." To create the simulation, the researchers used the Global Epidemic and Mobility Model. The model considers daily airline passenger traffic worldwide, along with the potential rate of spread in communities, hospitals, and burials. [I]f the outbreak is not contained, the probability of international spread is going to increase consistently, especially if other countries are affected and are not able to contain the epidemic. Projections show that the disease could reach 10,000 cases by September, but only if current control efforts are not ramped up. So the researchers admit that they need more data. Moreover, the extrapolations don't take potential containment strategies into account. This is a kind of worst case scenario — but one that (disturbingly) takes the current status quo into account.